The Porter Fountain is one of Rome's most famous human sculpture water fountains and also one of its "Talking Statues", the statues upon which political criticisms or witticisms were posted by Roman citizens opposed to the arrogance and corruption of the ruling class, starting in the 16th century. Sometimes in the form of a poem, a joke, or a political satire they were attached to the fountain late at night for people to read before they were confiscated by police in the morning. This fountain is of a water-seller in his uniform. The sculptor is unknown for certain, but it might have been sculpted between 1587 and 1598 by Jacopo Del Conte. It was moved to its present location in 1874 from the Palazzo De Carolis, near Piazza Venezia. The fountain is worth a gander if it's close to being on your way from one site to another, but you probably shouldn't go too far out of your way to see it unless you have a lot of time in Rome. 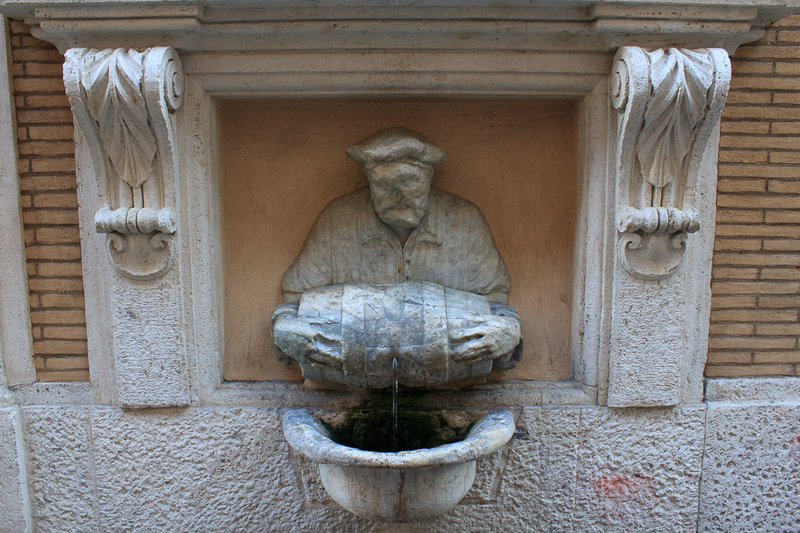 The similar Fountain of the Cask honors the wine porters of Rome. See all Porter Fountain photos.